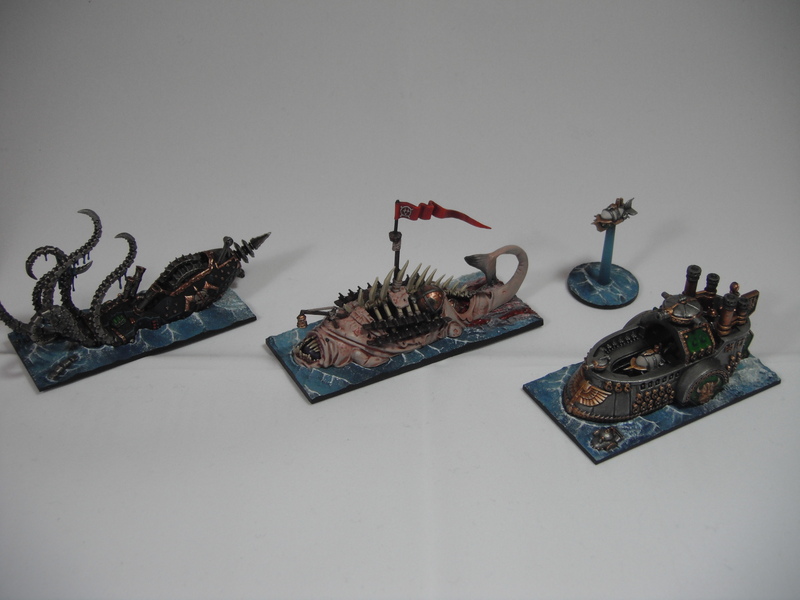 Recently I have turned my attention back to Dreadfleet. 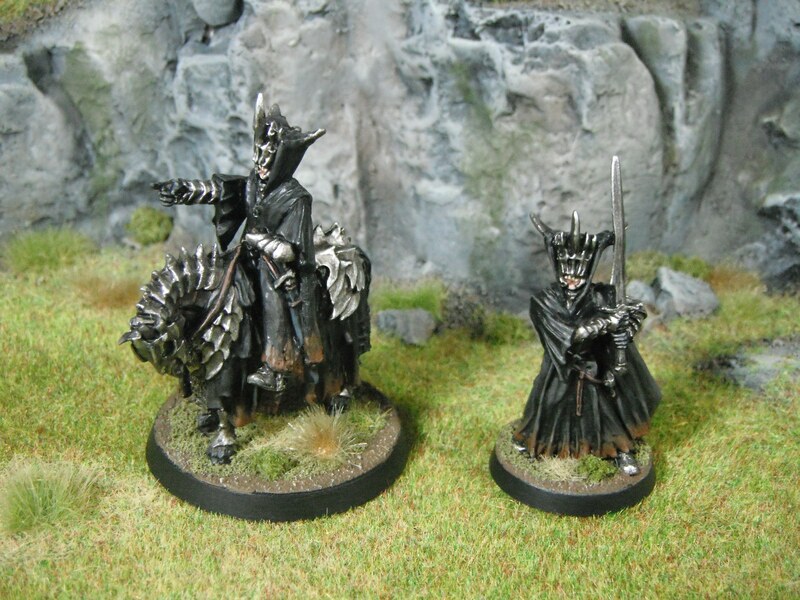 I bought this set a couple of years ago when it was first released and the models are simply too nice to sit around in a box unpainted. 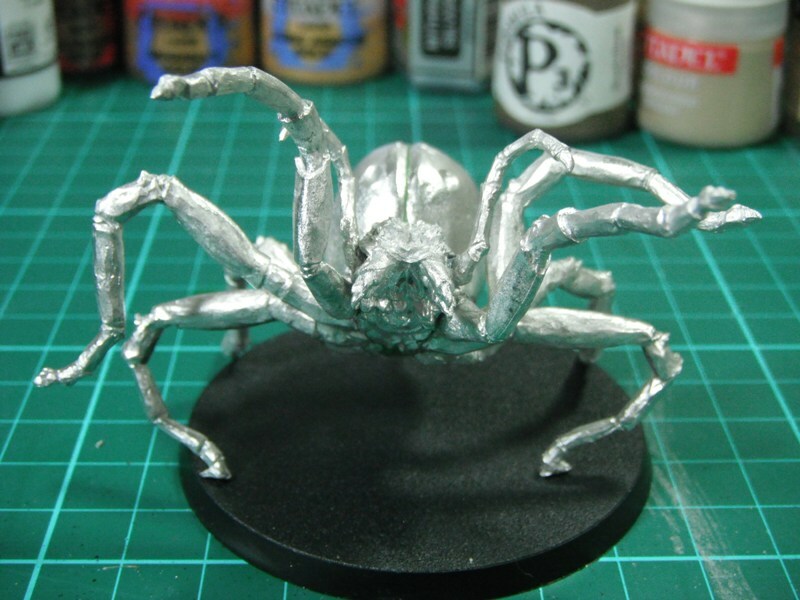 The models themselves are superb but they are quite fiddly to paint as they often need to be painted in several sub-assemblies before being glued together. 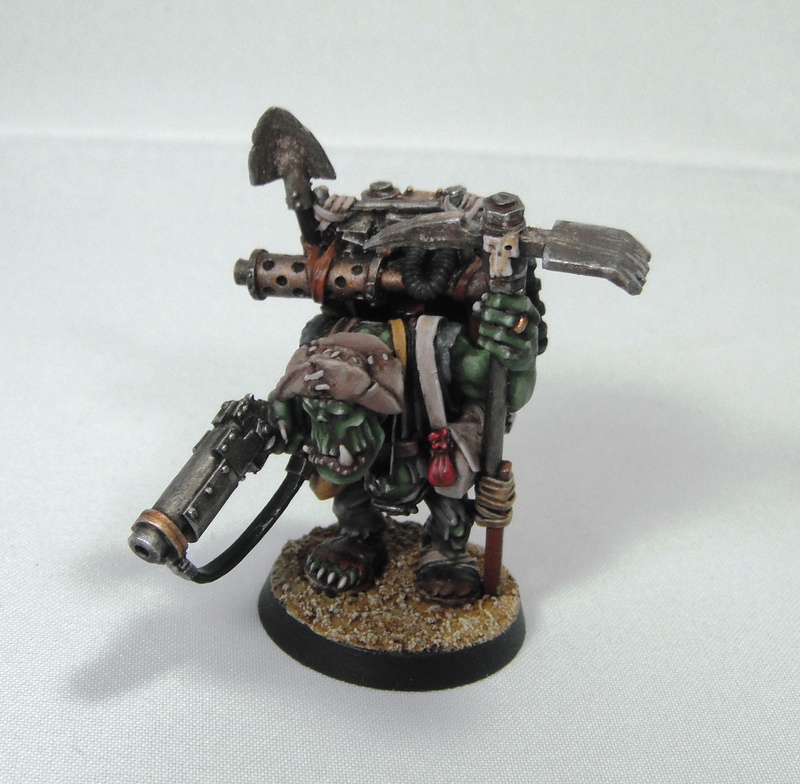 However, they are a nice change of pace from more traditional 28mm GW models and I can definitely foresee more of these models on my painting table in the not-too-distant future. 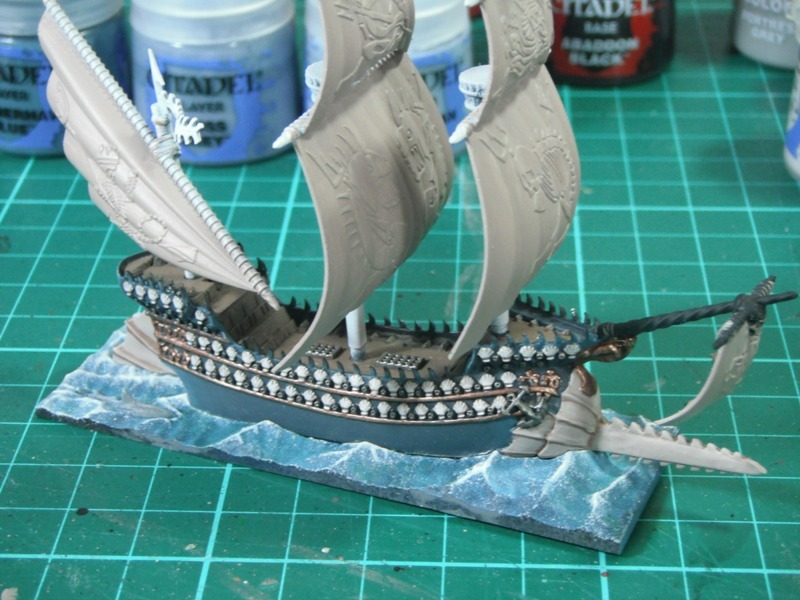 Over the Christmas holidays I made good progress on Grimnir’s Thunder, The Black Kraken and Skabrus. 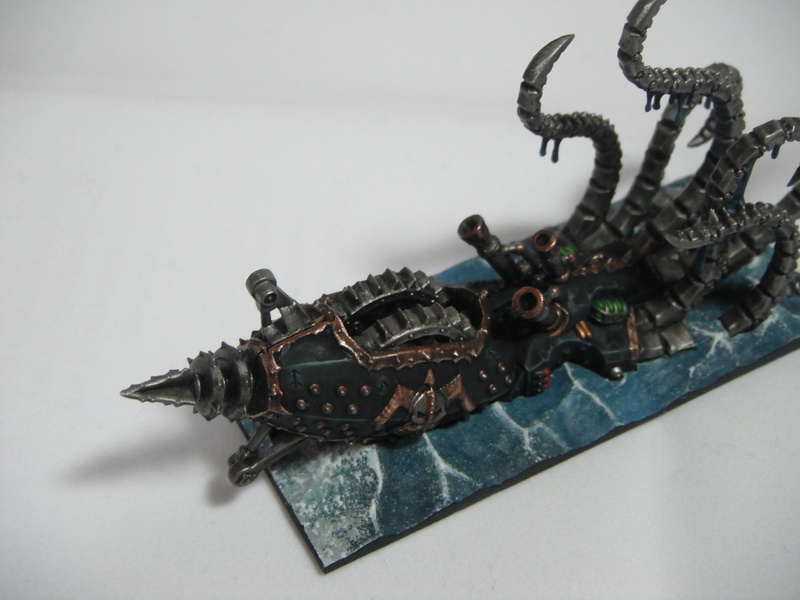 Initially I decided to work on Grimnir’s Thunder alongside my Astral Claws as I was painting lots of metalics anyway. 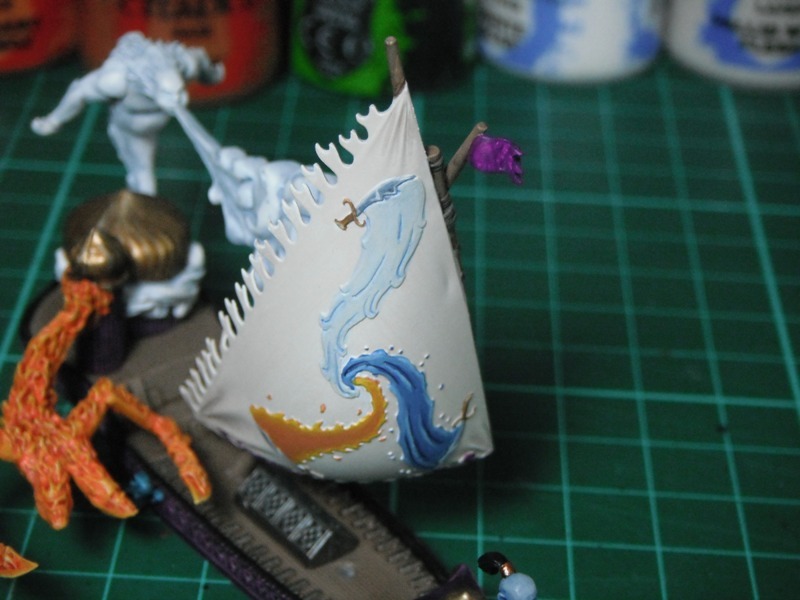 However, I got carried away with the Dreadfleet bug and painted a further two ships. 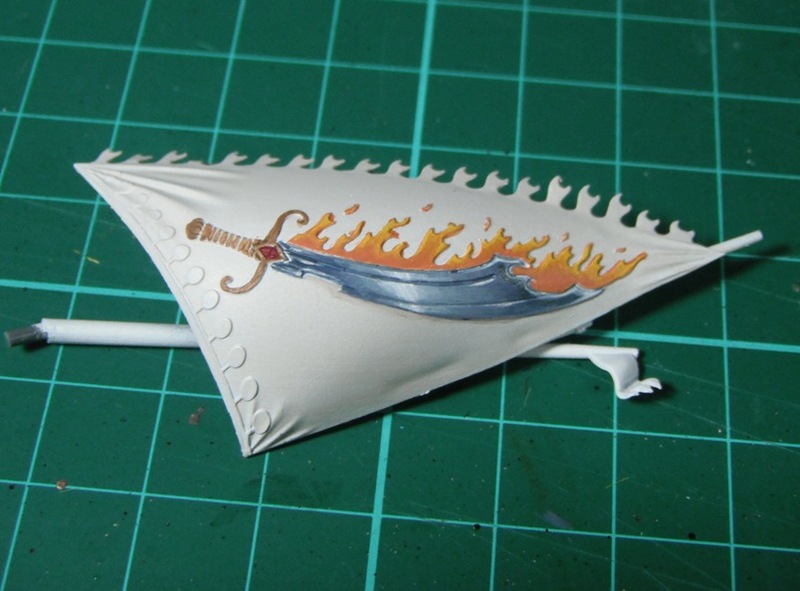 Grimnir’s Thunder followed my usual technique for painting silver. 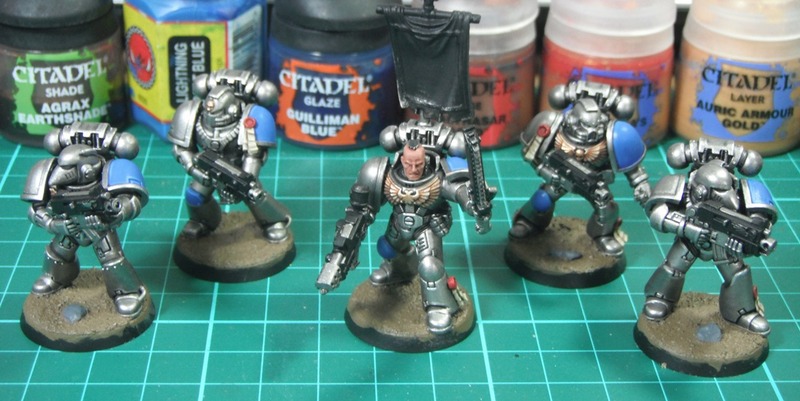 It was basecoated Leadbelcher before being washed with Nuln Oil and then highlighted using Leadbelcher followed by Mithril Silver. 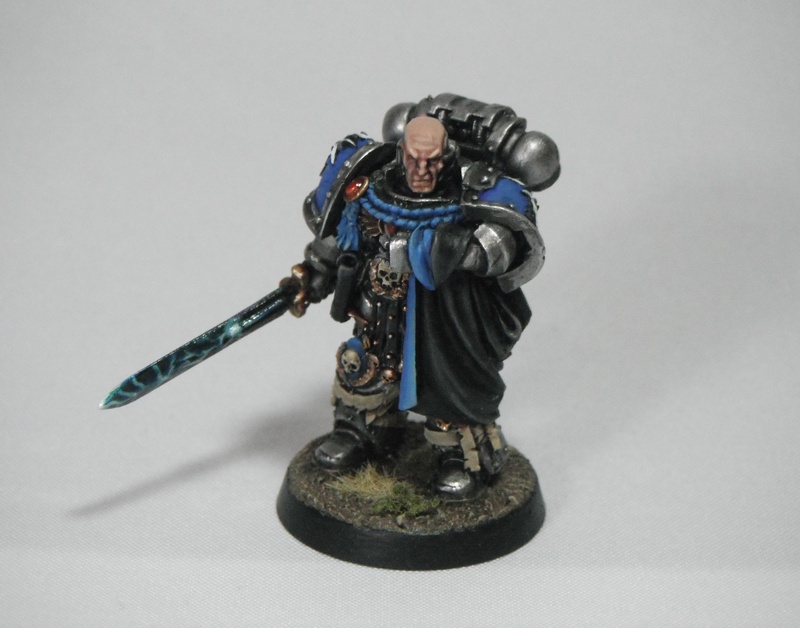 For the gold I used the new range of Citadel paints and I must say I was really impressed. I have been using old pots of Shining Gold and Burnished Gold for years and normally I hate painting gold. 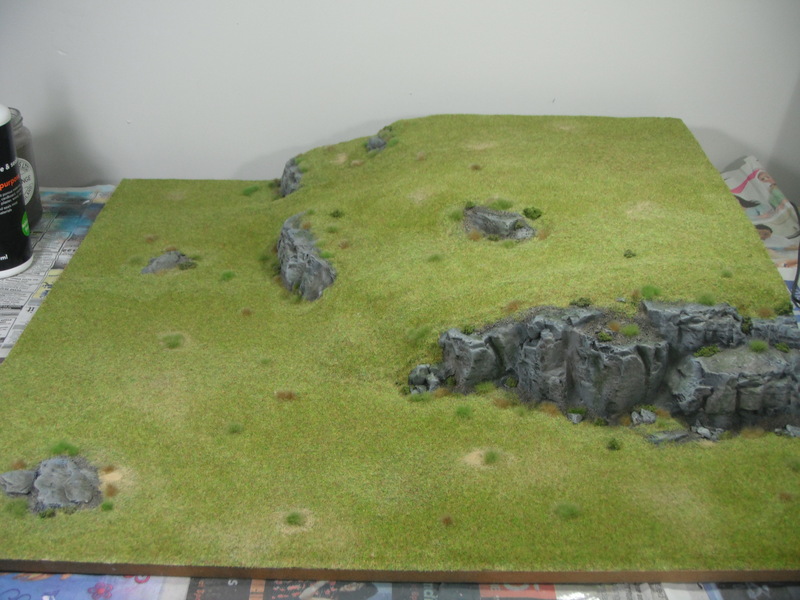 However, with the new layer paints it was straightforward. 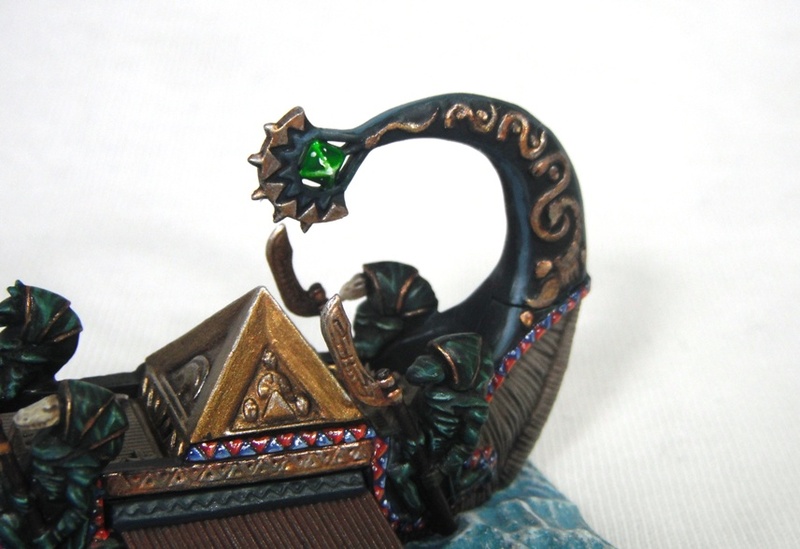 The gold was painted Balthasar Gold and highlighted using Ghenna Gold, Golden Griffon and then Golden Griffon with increasing amounts of Mithril silver added all the way up to pure Mithril. 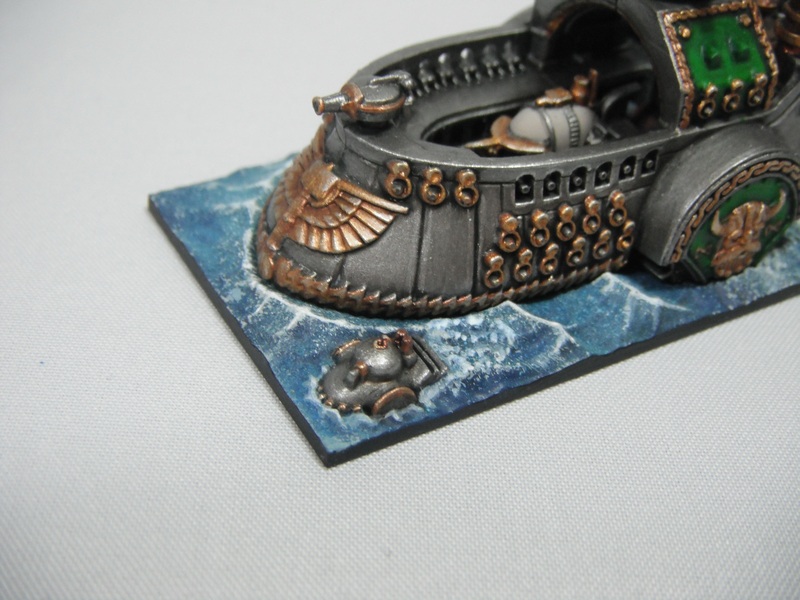 the gold was then washed with Agrax Earthshade. 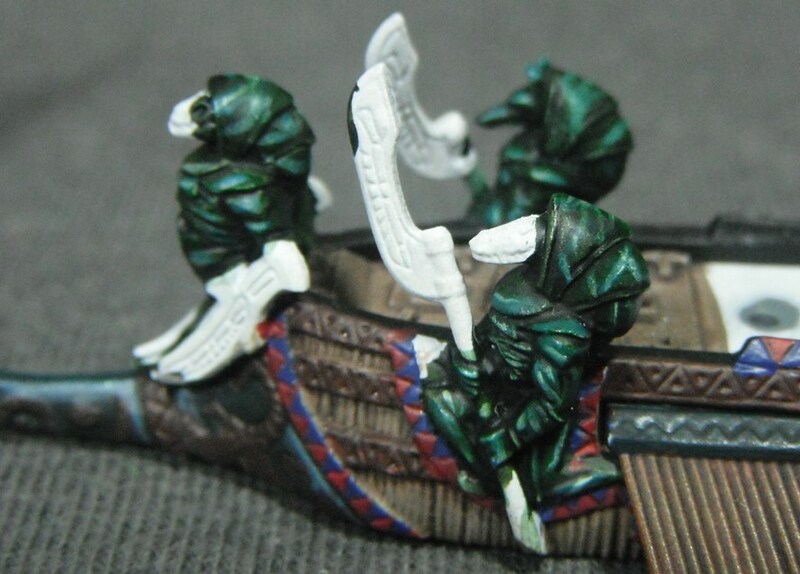 The green areas were painted Dark Angels Green and highlighted with Snot Green followed by Goblin Green. 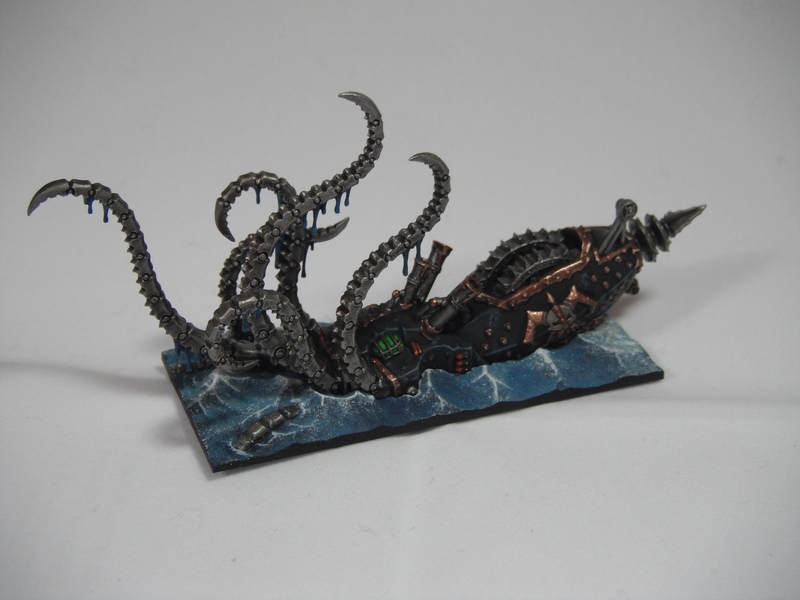 The Black Kraken was painted with GW’s new black/blue painted. 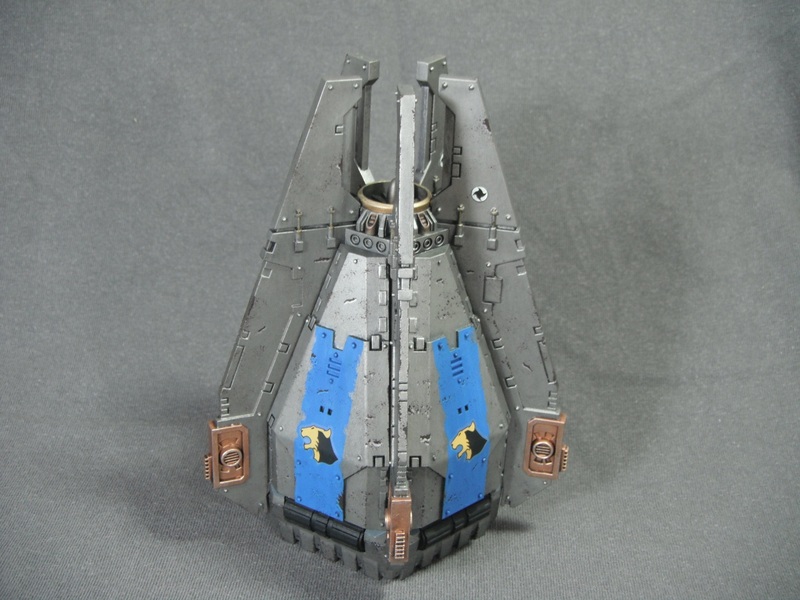 I started with a basecoat of Chaos Black and highlighted it using Dark Reaper, Thunderhawk Blue and Thunderhawk Blue mixed with a little Fortress Grey. 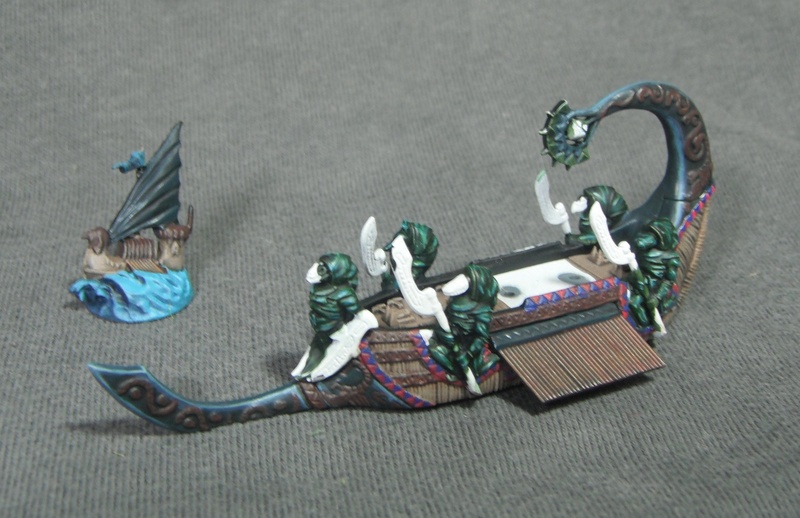 The brass areas also used the new paint range. 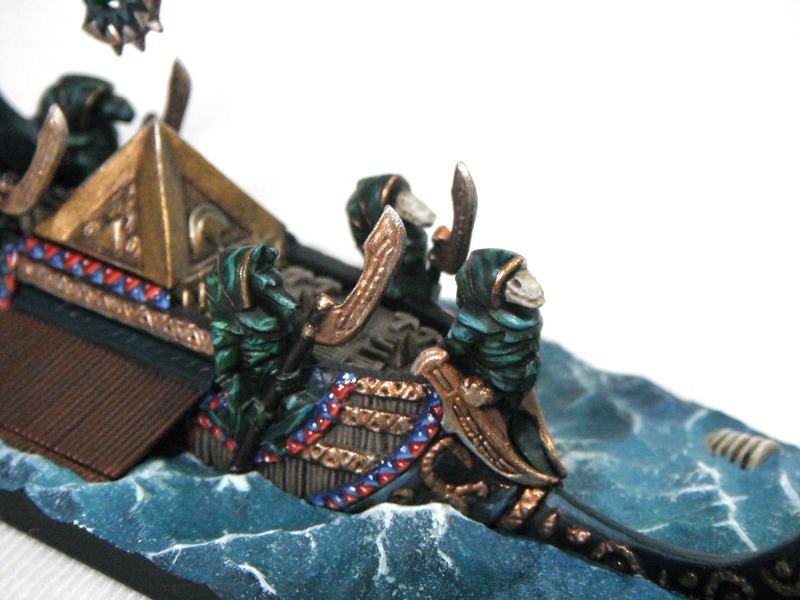 I started with Balthasar Gold washed with Agrax Earthshade and highlighted this using Runelord Brass and Sycorax Bronze. 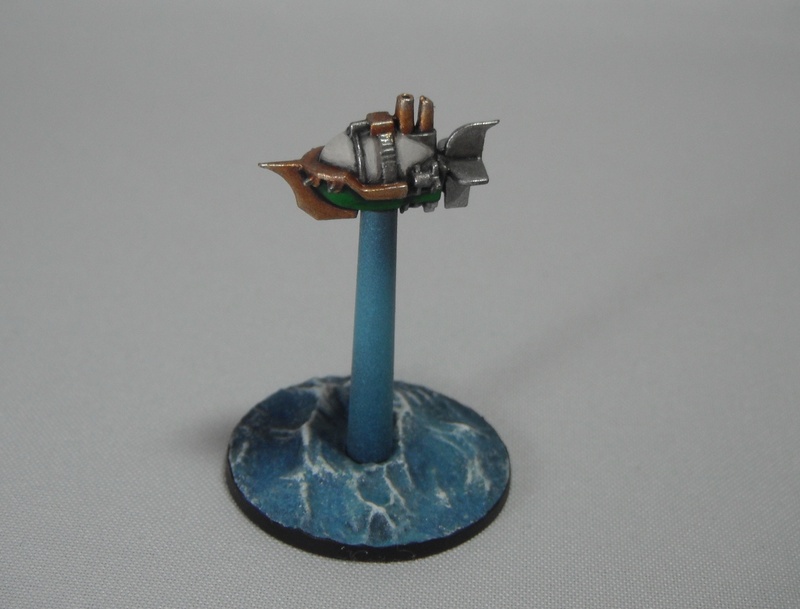 And finally one of my favourite ships from the whole set, Skabrus. 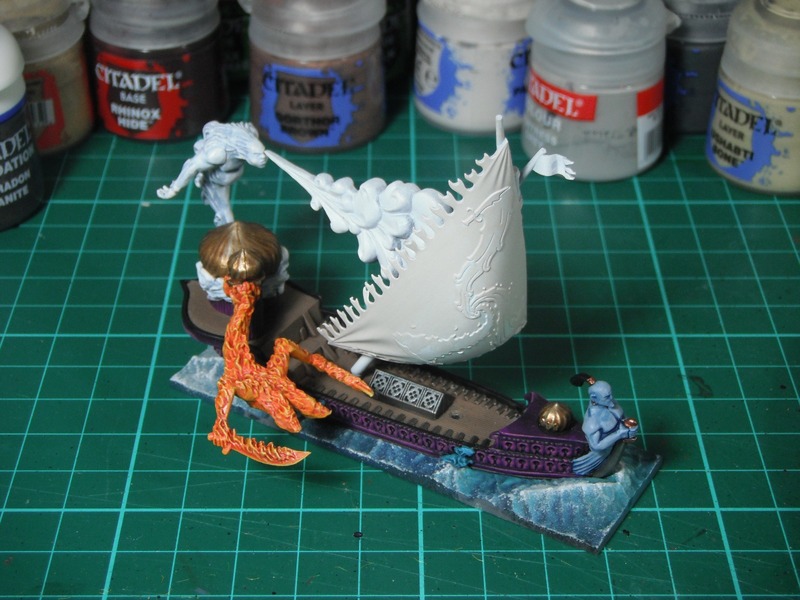 This is a really characterful and imaginative model (not to mention gross) and, like the other two ships shown here, it makes great use of negative space. 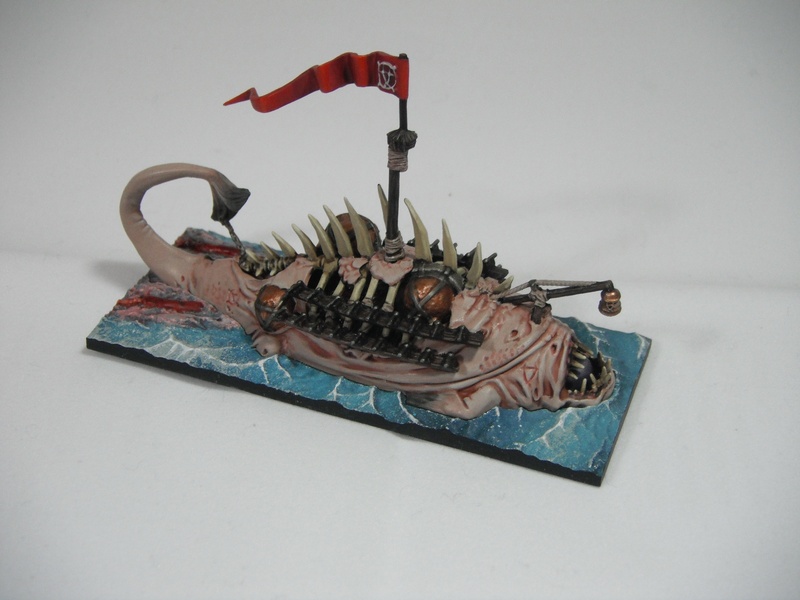 This is very much the zombie of the Dreadfleet, an undead sea monster summoned to unlife. 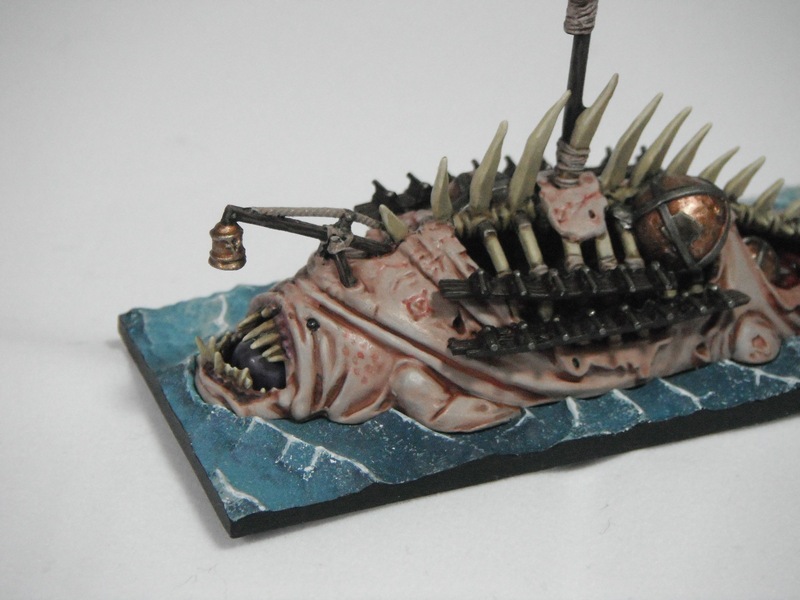 The fleshy areas were basecoated using a 50/50 mix of Tallarn Flesh and Space Wolf Grey. 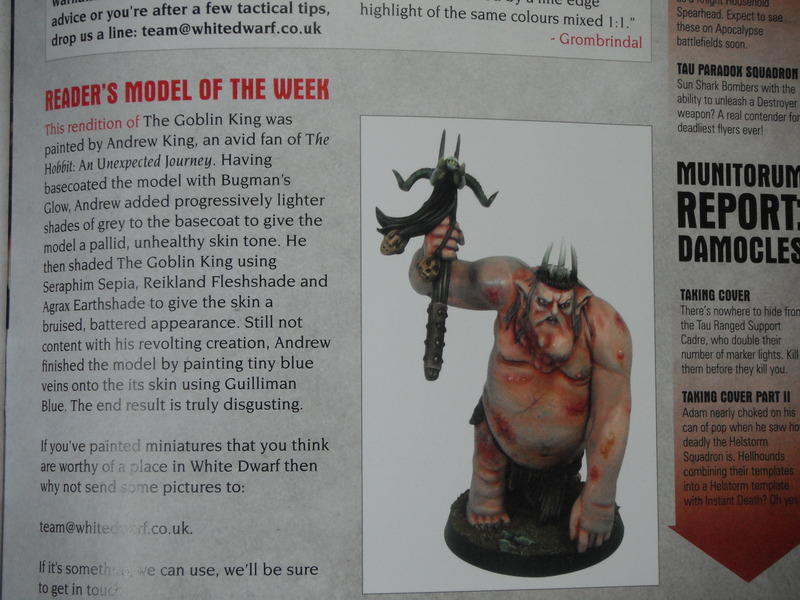 It was washed with Ogryn Flesh and highlighted using the original mix with increasing amounts of Space Wolf Grey added. 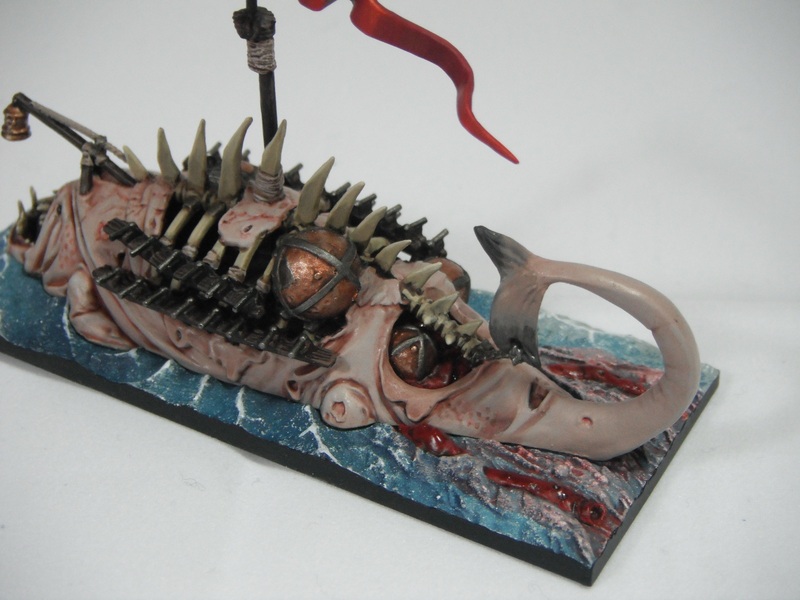 Areas were then glazed red and purple and mottling was applied to the skin using dots of Ogryn Flesh and Bloodletter. 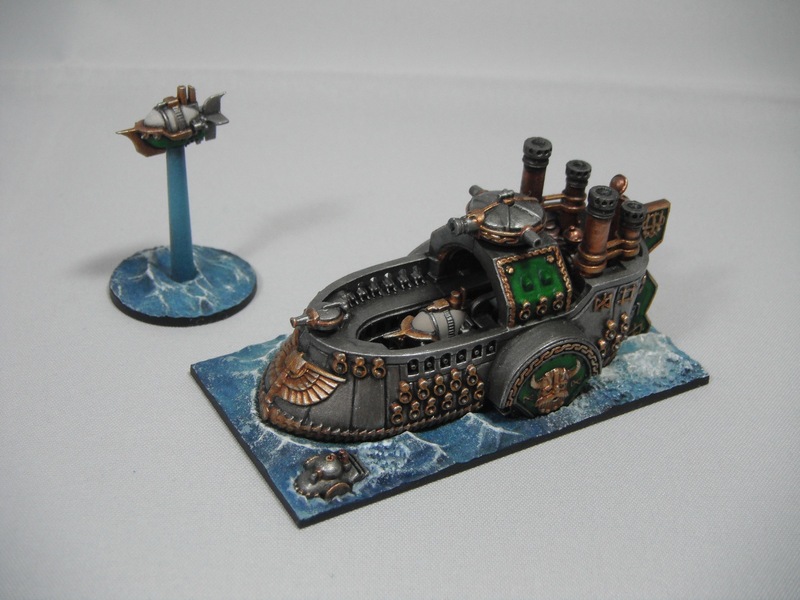 Over the weekend I managed to get a couple games of Dreadfleet against Nick and thought I’d share my thoughts on the game. The rules are straightforward and fairly easy to pick up. Our first turn took a while to complete but after that we quickly got used to the turn sequence and order of play. 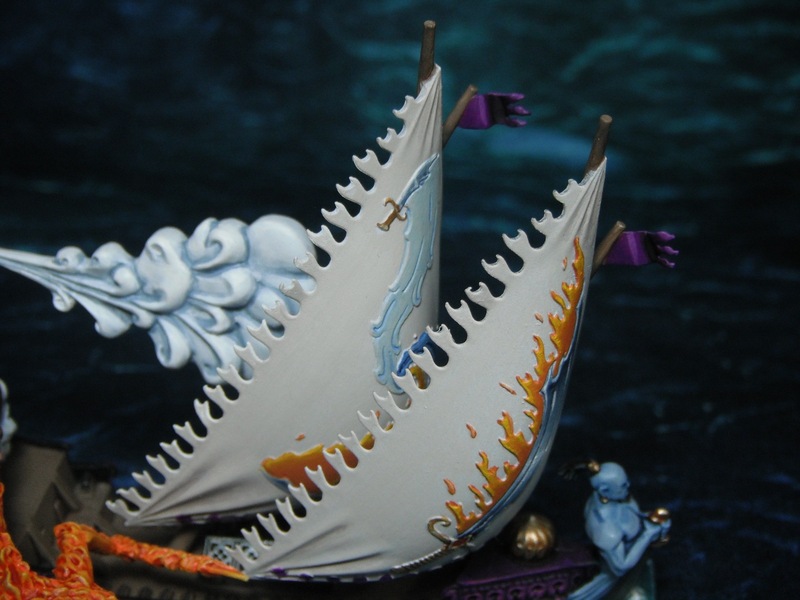 Initially the way in which the winds works was confusing (I’m not sure if it is explained properly in the book or whether we just missed it) but in the end we decided that the rules intended it to blow from the marker on the edge of the seascape towards the centre of the board. 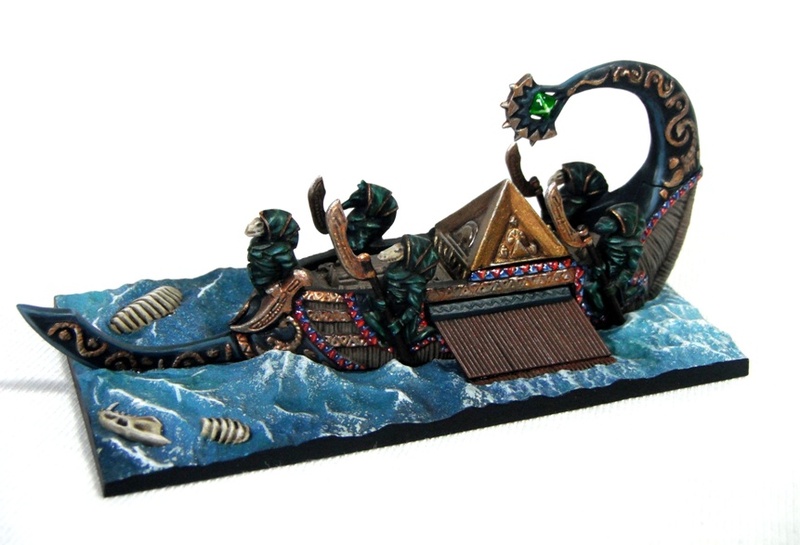 We played through the first scenario in the book, ‘Corpse Reef’, which pits Jaego Wroth and The Heldenhammer against Count Noctilus and The Bloody Reaver. 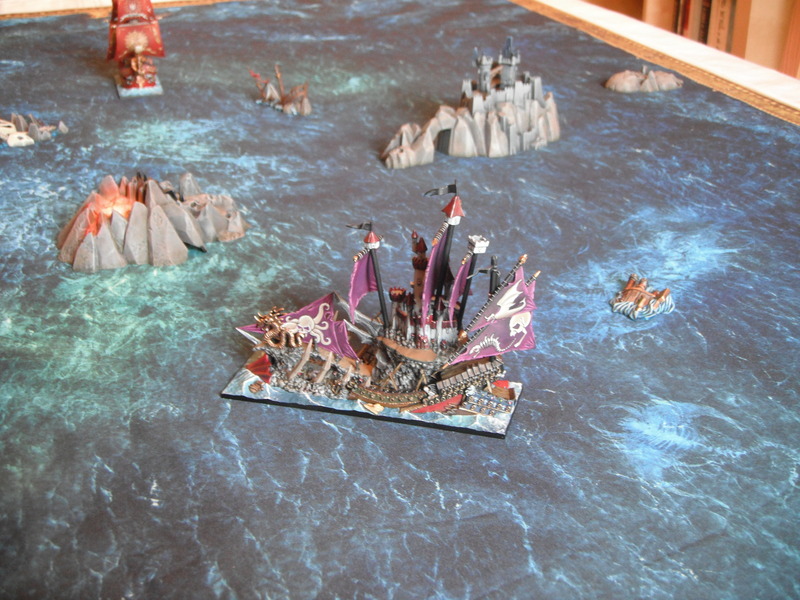 The objective of the scenario is to place 8 damage cards on your opponent’s warship. 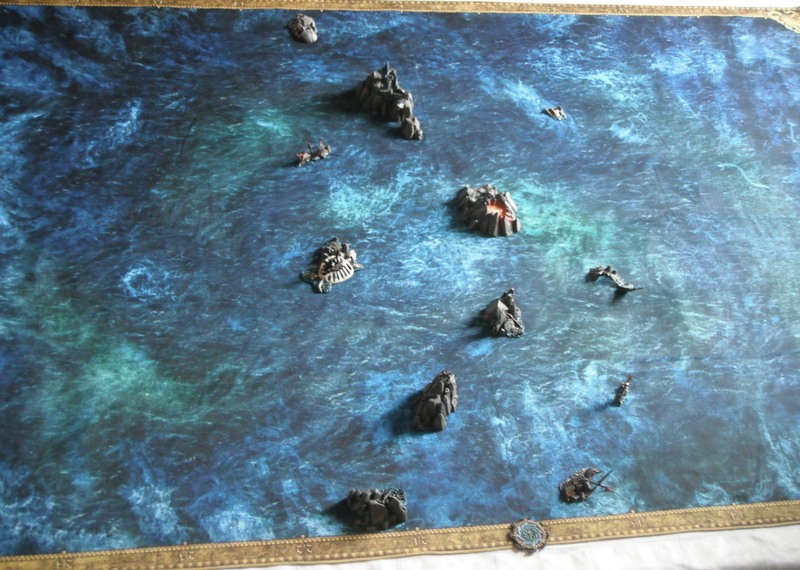 We set up the terrain following the example to represent the reef of bone that separates the Galleons’ Graveyard from the rest of the ocean. The games we played were great fun. 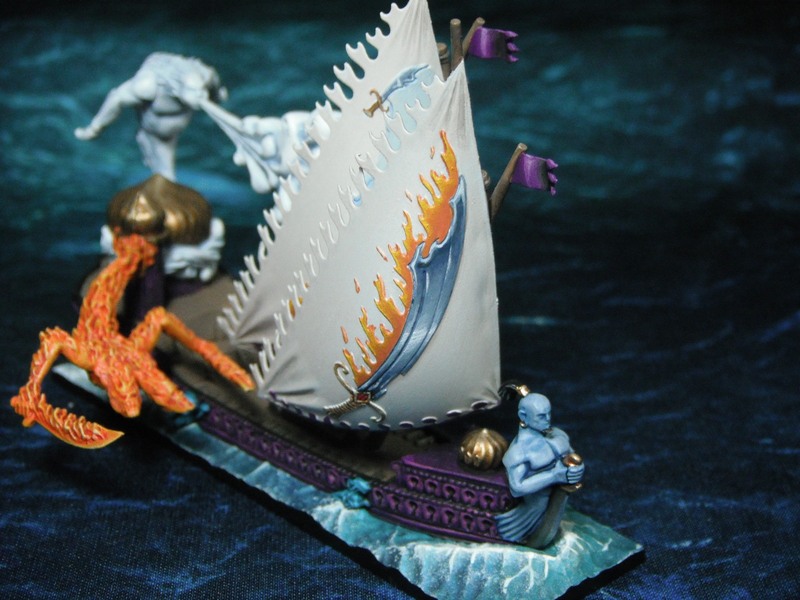 One of the things I like about Dreadfleet is the fact that the games uses an alternate activation sequence (much like Epic) where one player activates a ship and performs actions and then the other player does the same until every ship has moved. 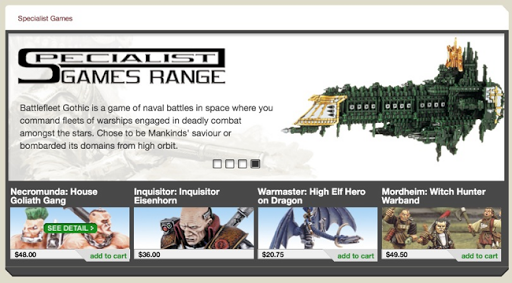 I’ve already written about how I think this style of play is much more fun and challenging than the you-go-I-go turn sequence of other GW games as both players are involved all the time. 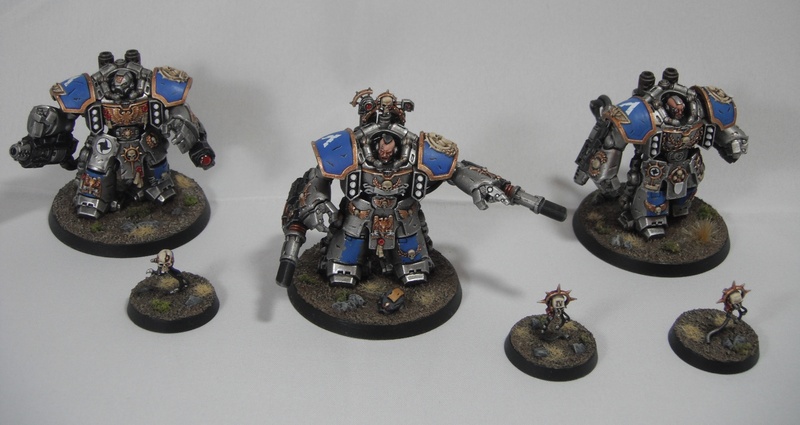 In the first game I took charge of the Bloody Reaver and Nick played as the Heldenhammer. 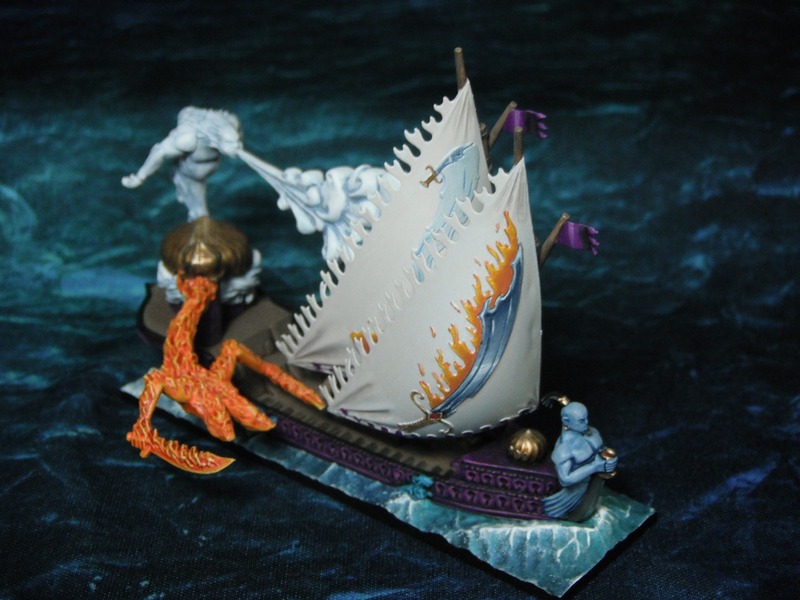 As this was the first game we were still getting used to maneuvering the ships and avoiding running aground against the many obstacles that litter Corpse Reef. An early Fate Card resulted in a Ghastly Fog engulfing the board and limiting visibility drastically, meaning that there would not be much shooting in the game. 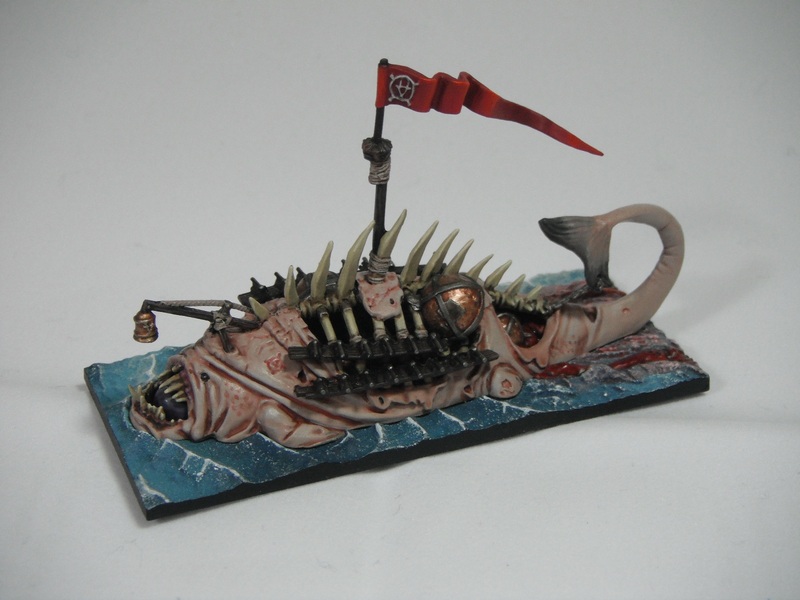 The Heldenhammer managed to trap the Bloody Reaver in the reef and I had no choice but to engage Nick head on. 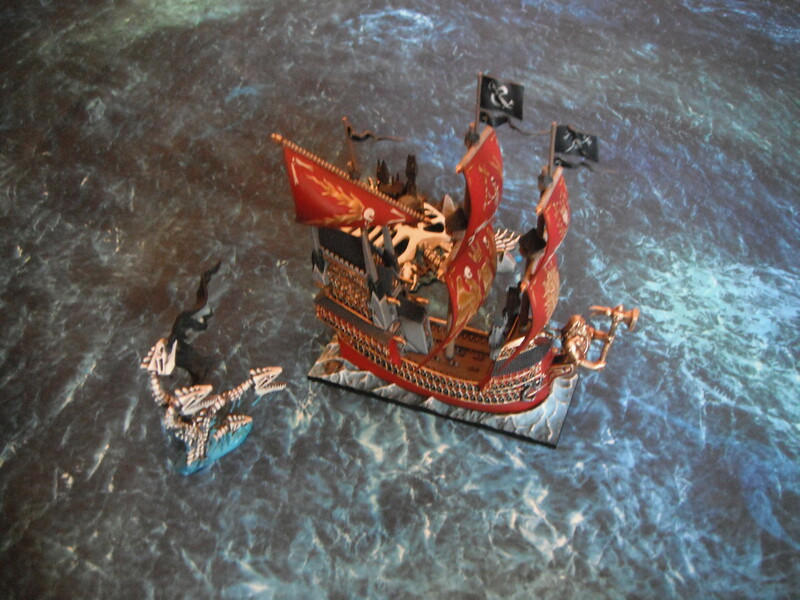 Noctilus managed to kill Wroth in a duel but, despite putting up a good fight (and Wroth’s crew being distracted by sirens), the Bloody Reaver was no match for the Heldenhammer‘s deadly figurehead and was smashed to pieces resulting in a victory for Nick. For the second game we swapped sides and I took command of the Empire’s flagship while Nick took the part of the dastardly count. This game was much quicker and smoother than the first as we had a much firmer grasp of the rules. 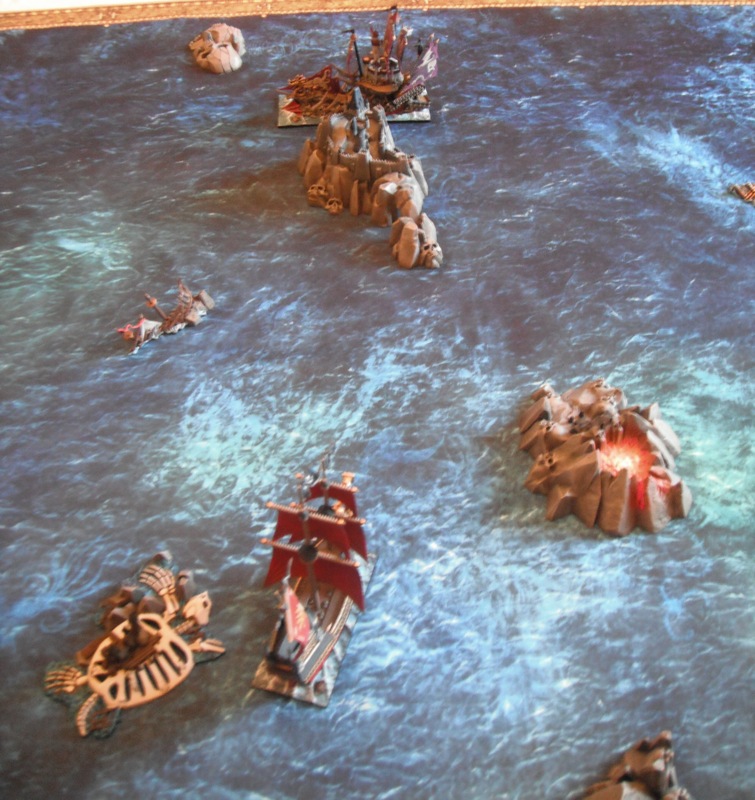 While the first game was dominated by the boarding action that resulted in the destruction of the Bloody Reaver, this game was much more focused on shooting and the early stages saw a lot of maneuvering as we both tried to line up the perfect broadside. This tactical maneuvering is a great element of the game and made things very tense as we each tried to bring our cannons to bear. 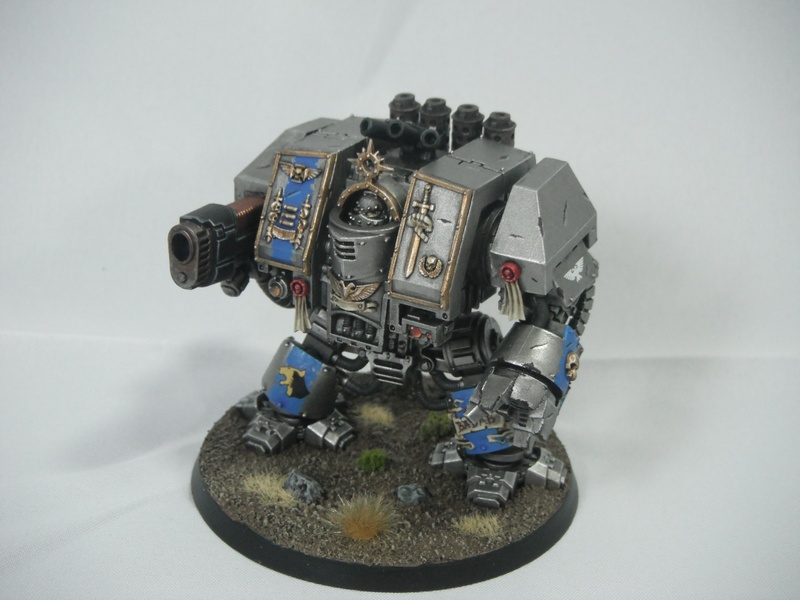 I managed to pull up alongside the Bloody Reaver but as Nick had issued the ‘Fire as She Bears’ order he got to shoot first claiming first blood. 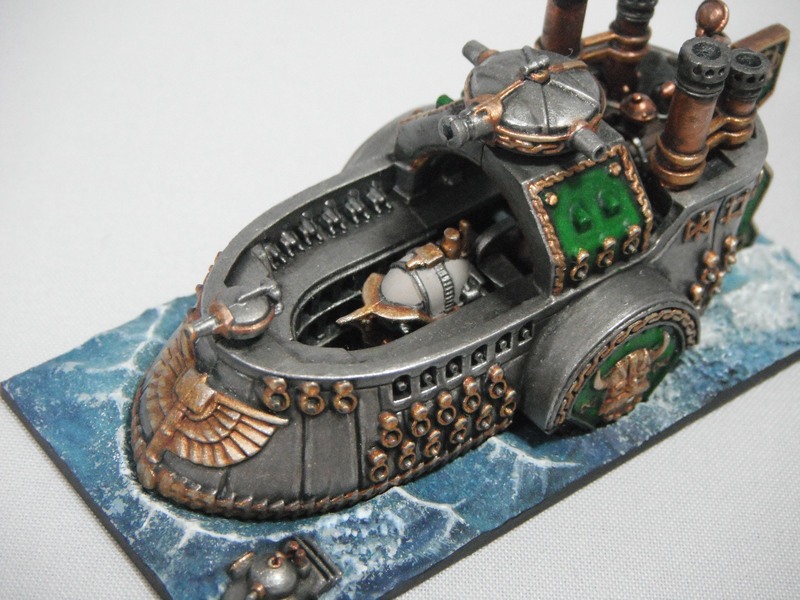 The Heldenhammer‘s magazine store caught fire, seriously damaging the ship. The fires continued to burn and next turn the magazine store exploded, destroying the ship. We decided to ignore this result and played for a few more turns (we didn’t want to end the game so early on). 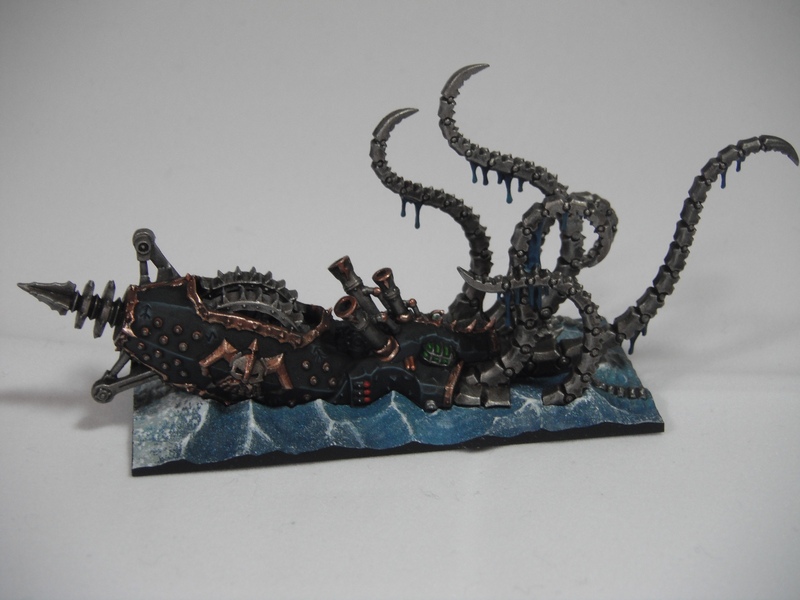 The Bloody Reaver initiated a boarding action against the Heldenhammer and, with the aid of a Bone Hydra summoned to Noctilus’s aid, managed to overwhelm the crew and claim another victory for Nick. Overall this is a fun, fast-paced game and we managed to get through two battles in an afternoon. 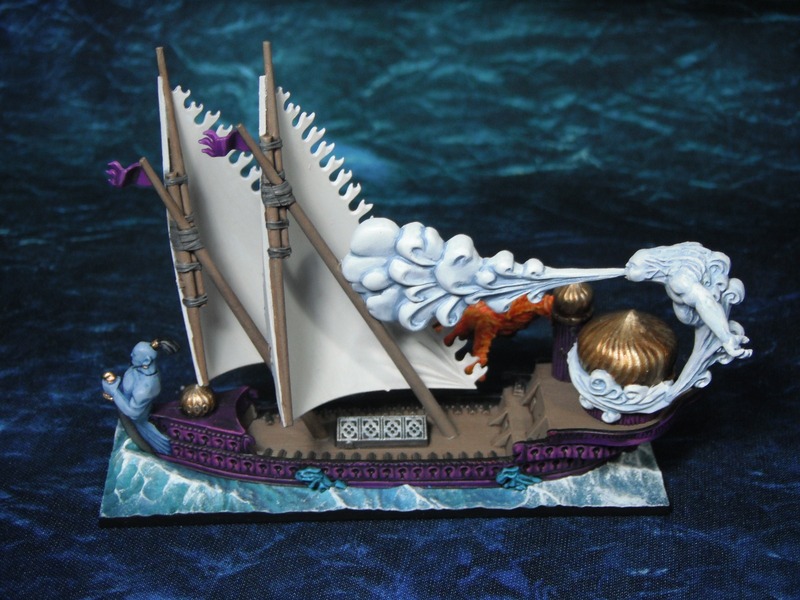 The only downside to the game was that some of the Damage Cards are too destructive, particularly in a game where there is only one ship on each side. 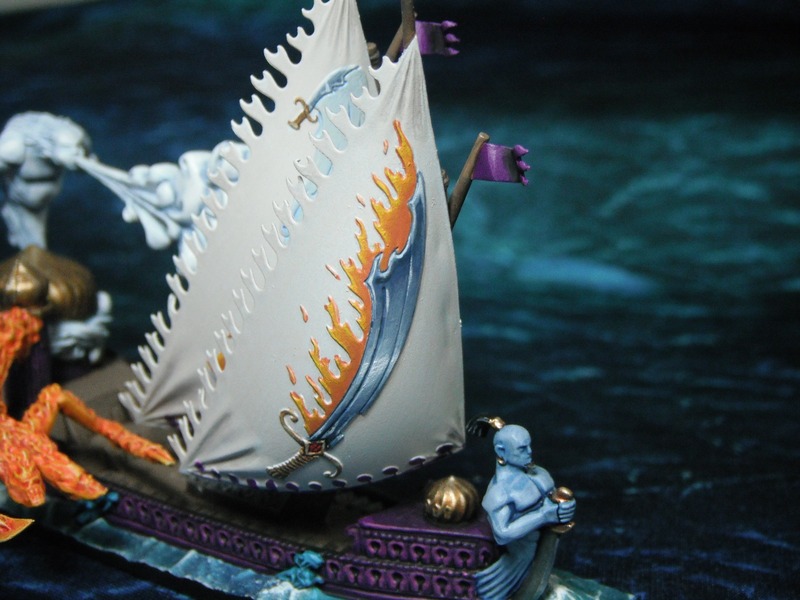 In the second game the Heldenhammer was destroyed by the effects of a single damage card (which inflicted D3 damage on the ship each turn). For small games in particular I would recommend removing the more destructive cards from the deck. 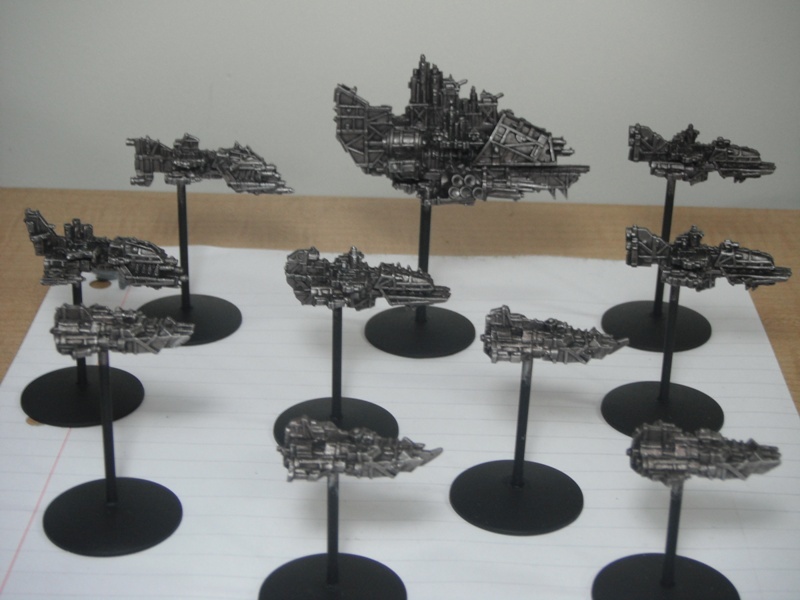 After all, you don’t want the game to be over after a single broadside. 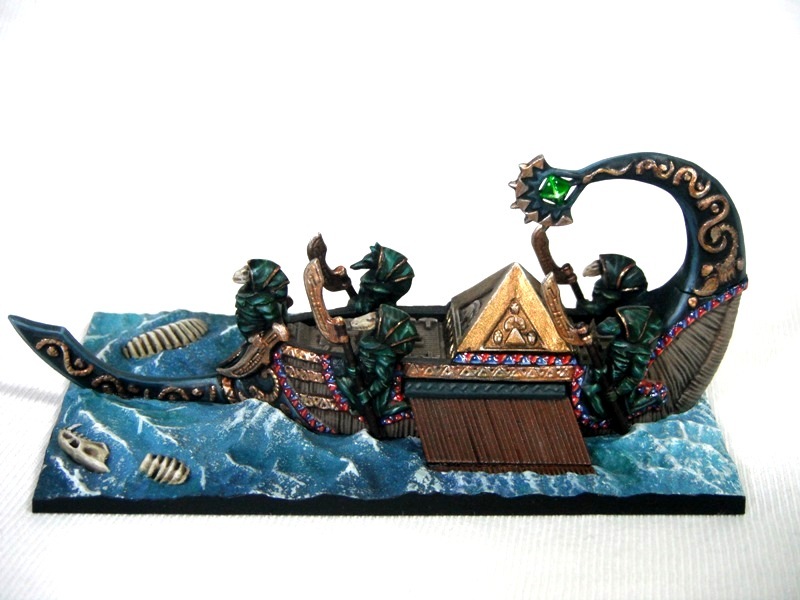 Other than this though, we had two very enjoyable games of Dreadfleet and I’m currently working on the Curse of Zandri in preparation for scenario two.